Do you have any self-proclaimed real foodies on your holiday gift list this year? If so, check out my list of 10 gift ideas for the real foodie in your life. This list is sure to contain the perfect gift for your real foodie loved one and I’ve included gifts ideas for every budget. 1. Le Creuset Butter Crock Butter is better–any real foodie knows that! But, having butter that is soft and ready to spread is the best. This butter crock from Le Creuset, with it’s air-tight lid, allows butter to be left out at room temperature for up to 5 days. If your real-foodie friend loves sourdough bread slathered with butter, this is the ideal addition to his or her kitchen. If your real foodie gift recipient is into cultured or fermented foods and drinks and he or she is a DIY’er, a Kombucha starter kit is a brilliant gift. Making your fist SCOBY is a time-consuming task. A kombucha starter kit can make the process easier. Perfect for the science and/or nutrition minded real foodie, Nutrition and Physical Degeneration by Dr. Weston A. Price is the book that convinced me and many others of the importance of a real food diet. Dr. Price studied several different cultures in the 1920s and found that “foods of modern convenience” were at the root of tooth decay, chronic disease and even the change in facial structure experienced by those cultures who had access to them. In contrast, the cultures that ate a traditional, unprocessed food diet were free from the health issues plaguing the modern world. This books belongs in the library of your favorite health-conscious friends and family. Do you have any friends who follow a gluten-free diet? What about a grain-free Paleo or Primal lifestyle? If so, then they need this book. The desserts featured in this wonderful cookbook by Carol Lovett of Ditch the Wheat are free of refined sugars and all grains, but are incredibly delicious. This is my go-to dessert cookbook when I’m craving something sweet, but healthy. Complete with beautiful pictures of the recipes’ finished products, this book is a kitchen gem! What’s so special about raw honey that it could be considered a great gift? Well, first of all, it’s unheated and unfiltered and therefore packed with the flavor that nature intended. In addition, it’s a superfood full of anti-viral, anti-bacterial and anti-fungal substances. 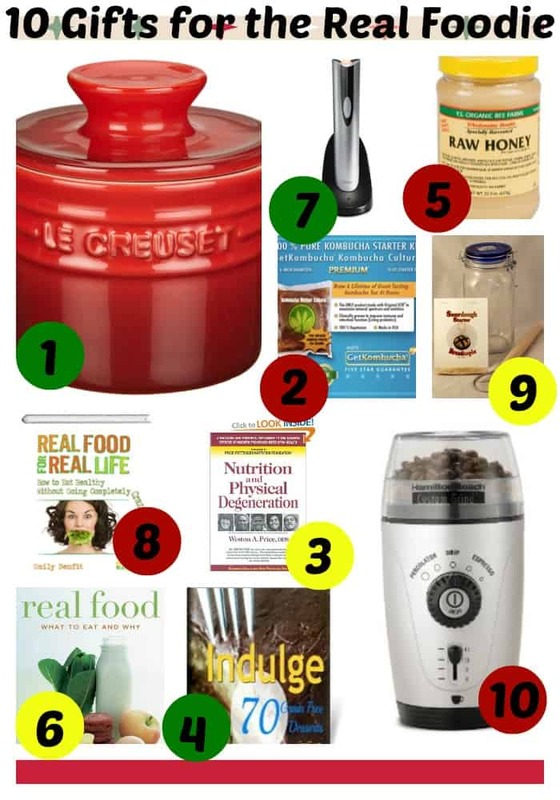 It’s another gift that is perfect for the health-conscious real foodie in your life. Once again a book makes the gift list. If you are looking for a great gift for a new real foodie, check out Real Food: What To Eat And Why by Nina Planck. This informative books walks the reader through all of the food groups and best options for each. The explanations are complete and convincing. This book is another great addition to a real food library. I’ll admit. This one is at the top of my personal wish list. I’m pretty brutal on cork screws and bottle openers. I’ve had a million. But this one is easy to use and a great tool for any real foodie who loves great wine. Your real foodie friend’s favorite organic wine might be out of your gift budget range, but this nifty electric bottle opener is a great gift idea for a great price! Sometimes being a real foodie is overwhelming. I love this book by Emily Benfit from Butter Believer. Real Food for Real Life is a healthy reminder to keep it sane in the midst of all of the food rules. This book is perfect for that friend or family member who tends to go all in on his or her pet passion. We want real foodies to keep up the real food lifestyle for a lifetime, not burn out after the first crazy year! This book can help any real foodie to remember the joy of eating and to stop worrying about the rules of real food. Sourdough bread was one of the first real foods I introduced to my family after we began our real food journey. It tastes amazing and digests gently. Spread liberally with softened raw butter and drizzled with melted raw honey, it is real food at its finest! And the most amazing part is that this gift can last for generations! That’s right. The sourdough mother culture lives on forever when tended to properly. You could give your real foodie friend a gift that he or she could eventually pass on to others! We’ve covered gifts for the food lover and the wine lover. We cannot forget the coffee snobs connoisseurs among us. Did you know that coffee begins losing its flavor soon after it’s ground? That’s why grinding your own beans is an important part of great tasting coffee. If your coffee-loving friends and family haven’t invested in a coffee bean grinder, help them out! They’ll never go back to pre-ground once they’ve tasted the flavor of fresh-ground!